THE CASTLE OF GRAMVOUSA AS WE KNOW IT TODAY WAS BUILT IN THE 16TH CENTURY (1579-1584) BY THE VENETIANS OUT OF THE FEAR OF OTTOMAN EXPANSIONISM. IT IS CONSIDERED AN ARCHITECTURAL MASTERPIECE OF ITS KIND AND BECAME AN IMPENETRABLE FORTRESS. The strategic position of the castle allowed its Venetian rulers to control the strait between Western Crete and Peloponnese. In spite of this, the Venetians failed to prevent the occupation of Crete by the Ottomans. In 1645, after a brief siege, the Ottomans occupied Chania and by 1669 they had conquered the whole of Crete. The Treaty of Morozini allowed the Venetians to keep control of the castle of Gramvousa (as well as the islets of Souda and Spinalonga) with the hope that one day they would regain control of Crete. Gramvousa was used as base by the Venetians who were trying in vain to regain Crete, but also by the Cretans who were resisting the Ottoman rule. In the summer of 1692, the castle was handed over to the Ottomans by the Venetian commander of Calabria, Luca Della Rocca. In return, the Ottomans granted him some kind of authority in Istanbul and started ironically calling him “Captain Gramvousa”. They then fortified the castle with 66 long-range cannons, they stationed strong troops and made it impenetrable. For many years after that, all revolutionary activities of the Cretans were limited to a minimum. During the Greek revolution against the Ottomans, Gramvousa played a very important and decisive role. After several attempts, the castle was finally conquered by the Cretan rebels in 1825, when some of them managed to get inside dressed as Ottomans. 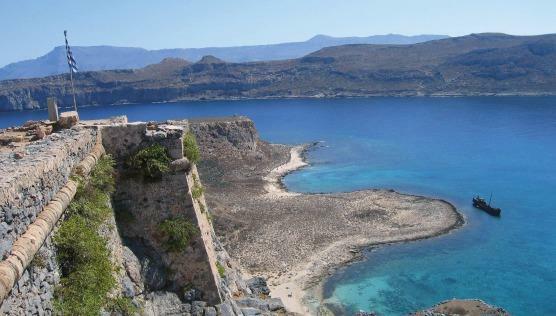 Gramvousa was the first part of Crete that was liberated from Ottoman rule. It served as a shelter for more than 3,000 people and became the starting point for all rebel activities. The rebel groups called “Kalisperides” would start from Gramvousa and terrorise the Ottomans who would use their armed forces called Zourides to set up ambushes against the Christians. However, due to the difficult living conditions, the people of Gramvousa started engaging in piracy and attacking all passing boats between Gramvousa and Antikithira, something that roused the European public opinion against pirates. After signing an agreement with the Greek government, the British and French navies occupied the castle in 1828 and drove out the pirates. The Protocol of London left Crete in Ottoman hands and in 1831 the Russian Guard of Gramvousa gave the castle back to the Ottomans as an ultimate sign of international justice.